I’m a master procrastinator. All weekend I knew I was going to make a roast for lunches this week. And all weekend I procrastinated taking it out of my freezer. I have so much stuff in my freezer, it’s hard to find what I want. The funny thing is when I finally went down to the freezer, at 10PM on Sunday, the roasts were right there on the top. However, it wasn’t a bad thing. I got to read up on how to cook frozen roasts (which led me to my recipe – which DOESN’T contain onion soup mix! 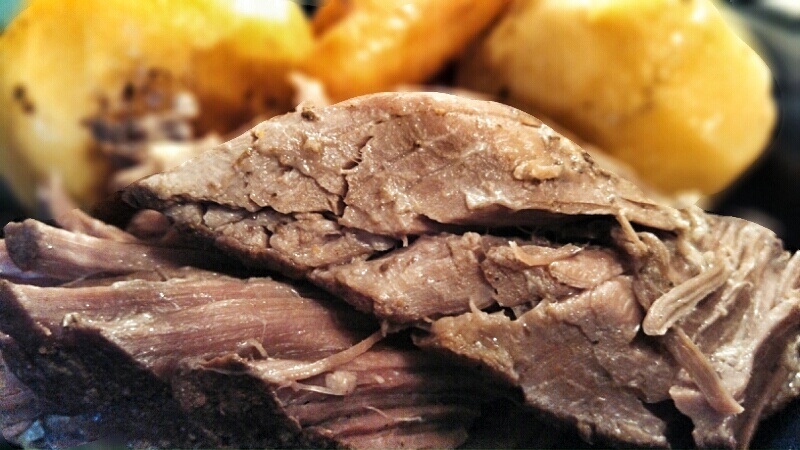 ), and how to defrost quickly when your roast doesn’t fit into your crockpot when it’s frozen solid. So, everyone gets to share in the joy! Here come the meat sweats!